LG Chem put out its powerful new weapon that has an eye upon number 1 position in small-battery market. Following number 1 position in medium to large-sized battery share, its will is to capture top position in small-battery as well. LG Chem announced on the 28th that it became the first in global battery industries to develop Hexagon Batteries and mass-produce them by end of the year. Hexagon Batteries are for Smart Watches. Compared to previous rectangular or square batteries for circle Smart Watches, its use of space and degree of freedom in design are much better because its shape is similar to a circle. It can miniaturize products and it can increase battery capacity up to 25%. It is predicted that battery’s life will increase 4 more hours compared to previous ones. “A reason why we are mass-producing Hexagon Batteries are due to increased recent demands for circular design. 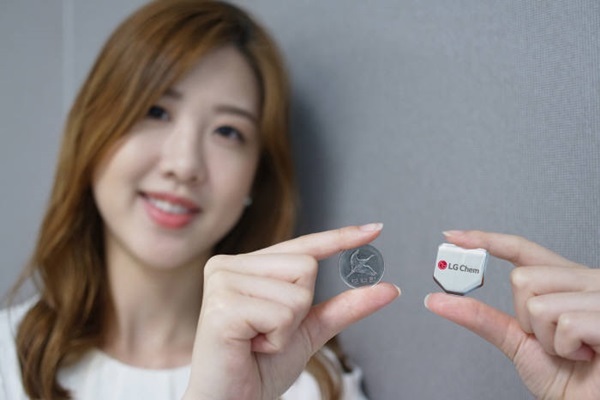 We have worked together with global IT companies on developing battery technologies for Smart Watches.” A person affiliated with LG Chem explained why it started developing Hexagon Batteries. A percentage of importance of circular design in global wrist watch market is more than 90%, and global IT companies have recently started releasing Smart Watches that are applied with circular display. Global market investigative company called Gartner is predicting that Smart Watches will take up about 40% of all wrist watch market by 2016 and more than 100 million Smart Watches will be sold by 2020. With the release of Hexagon Batteries, LG Chem is strengthening small-sized ‘Free Form Battery’ business that can be made in any shape. Free Form Battery is applied with LG Chem’s patent technology called ‘Stack & Folding’ that makes it possible to be made in any shape or form. Stack & Folding method is a technology that injects electrolytes after stacking anode material, separation film, and cathode material layer by layer. Compared to Winding method, its application fields are wider due to its realization of degree of freedom in design, energy density, and stable performance. LG Chem focused on promoting small-sized battery field as its new growth engine by developing ‘Step Battery’, ‘Curve Battery’, and ‘Wire Battery’ in 2013. It is planning to mass-produce new products after many years like L-shaped battery and ‘ㅁ’-shaped battery that a hole in the middle. It is possible to increase capacity more than 20% compared to previous square battery by maximizing use of space inside. “We secured 10 global customers in Free Form Battery field after 2013. One most certain method to lead in the market is making and promoting a new market that doesn’t exist in the world, and we are going to take the top position in small-battery field in 2018.” President Kwon Young Soo of LG Chem’s Battery Business Department said about what LG Chem is going to do in the future.